Like millions of sports fans I watched the controversial last play of the Seattle Seahawks and the Green Bay Packers on Monday Night Football. It was a Hail Mary pass from Seattle quarterback Russell Wilson followed by what punsters at ESPN are now calling “the inaccurate reception.” Replays show Green Bay safety M.D Jennings intercepting the pass, Seattle’s Golden Tate wrestling it away from Jennings, as one referee signals it an interception and the other calls it a Seattle touchdown. 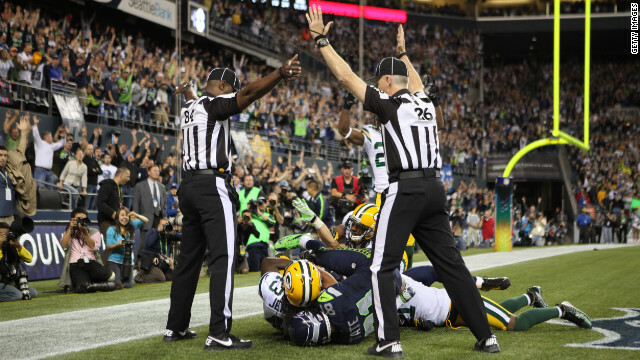 It is officially ruled a touchdown and Seattle wins the game. Commentators immediately began their rants about terrible officiating, followed by renewed calls to get the replacement refs off the field and the locked-out professional refs back in the game. In this pluralistic age I am unaccustomed to such unanimity and agreement. It made me wonder if beneath this surface issue is an insight into our essential human nature. First, humans have an underlying sense of right and wrong. C. S. Lewis argued that there is a fundamental morality (he called it the “Tao”) that resides in the heart and conscience of every human and is therefore shared by all cultures East-West, Christian, Pagan and Jew. Could it be that it is also found in the hearts of rabid sports fans! In sports we see two competing passions, a desire to win, but also a desire to win fairly, within the rules. What made Seattle’s win unsatisfying even for Seahawks fans, is that the referee violated the Tao of football, and fans and commentators are furious about it. It appears that situation ethics doesn’t apply in football. It is no accident that referees wear black and white uniforms. There is right and wrong and the referee’s job is to assure that right prevails. 2) We long for a better world. I realize that many of my frustrations in life have to do with this tension between the way things ought to be and the way things are. These instincts and desires for a better world are released passionately when a bad call is made in a football game. We’re looking for stable places in society we can depend on. When institutions like government, churches or the NFL fail to provide it we are disheartened! Might a failed football call reveal something deeper about our universal hopes and dreams? Could it be we really do wish God was running the show?